This blog post from Summer Dental in Las Vegas looks at the cost of dental implants. If you’ve researched it online you may have found that getting a straight answer can be elusive. But there is a reason for that. 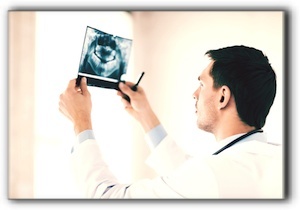 It can be confusing to research the cost of a dental implant and finding nothing solid. We’ll use this space to discuss why most dental practice websites don’t publish this information. The number of teeth being replaced may be more than the number of implants needed to cover that section of the mouth. Implant dentists want to offer accurate pricing rather than scare you away with higher estimates. It takes a quick consultation to review dental history, evaluate needs and construct a treatment plan. This could mean a more efficient surgery with fewer implants. While dental implants really are the state of the art in tooth replacement, much better than a bridge or denture, sometimes the technique won’t be what you thought it was going to be, or maybe you aren’t a good candidate for the process. A ballpark number might be possible to post on the Internet but the changing cost of supplies and lab fees make it impossible to guarantee an accurate price. Dentists who offer implants can precisely calculate dental implant surgery costs based on current prices when you come in for a consultation. Please make an appointment to quickly and accurately get these answers. At Summer Dental in Las Vegas, our patients always come first – whether it’s for a dental implant, or a simple checkup and cleaning. Schedule an appointment with us today. This post from Summer Dental in Las Vegas looks at pricing dental implants. Many patients say it’s hard getting a quick answer, which they find to be frustrating. But there is a reason for that. It can be confusing to research the cost of getting a dental implant and finding nothing solid on the web. 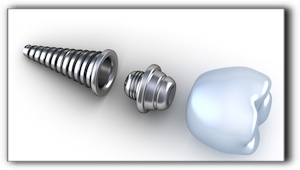 Let us take a moment to explain why most dentistry sites don’t publish the cost of implants. The number of teeth being replaced may be more than the number of implants needed to cover that section of the mouth. Implant dentists want to offer accurate pricing rather than scare you away with higher estimates. It takes a simple consultation to review dental history, evaluate needs and design a treatment plan. This could mean a more efficient surgery with fewer implants. A ballpark number might be possible to post on the Internet, but the changing cost of supplies and lab fees make it impossible to guarantee a specific price for full mouth dental implants. Dentists who offer implants can accurately calculate dental implant surgery costs based on current prices when you come in for a consultation. Please make an appointment to quickly and accurately get these answers abourt dental implants from Summer Dental in Las Vegas. We also offer orthodontics, and a full range of dental services. Call for an appointment today. 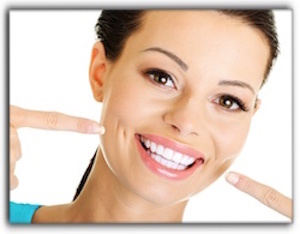 We all know that a healthy smile requires cavity-free teeth and healthy gums. But here’s a question from Summer Dental in Las Vegas: how often do we appreciate our jaw bone? Our teeth need a strong firm foundation to remain healthy and beautiful. This post looks at bone recession. Occasionally, a patient experiences bone recession in their jaw which can cause tooth loss and other troubles. However, it is ordinarily the other way around. The bone loss occurs as a result of a lost tooth because the blood supply and stimulus needed for maintaining healthy bone is taken away. Bone is living tissue and needs stimulation to stay healthy and retain its size and density. Biting, chewing, talking and all the other normal mouth functions keep the portion of the bone surrounding the tooth root healthy. When a tooth is extracted, the bone that used to anchor the tooth root recedes as if it understands that it is no longer needed. 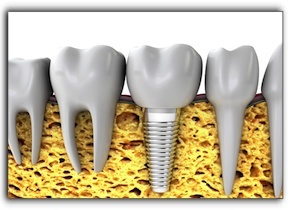 A dental implant provides stimulation similar to the natural tooth and can prohibit bone recession. A gum infection can result when gum inflammation goes untreated and progresses to periodontitis. With periodontitis, the gums pull away from the teeth creating pockets which provide the perfect breeding ground for the dangerous infection. Gum infections can proceed undetected, though there are usually warning signs. Swollen, painful gums, loose teeth, and gums that bleed when brushed are symptoms of periodontitis. The infection dissolves bone as the gums pull away from the tooth. Inadequate oral hygiene increases the risk of gum disease but other factors can compromise gum health. These include smoking (no surprise here), hormone levels, diseases that lower immune system effectiveness, medications that cause dry mouth, and genetic predisposition. An abscess is a pus-filled pocket of infection that occurs in the nerve and roots of a tooth. As the infection attacks the tooth and bone tissue it creates a space that fills with pus. There are several treatments for a tooth abscess including antibiotics to kill the infection, a root canal, or extraction, if necessary. If you would like to replace a missing tooth with an implant, but don’t have enough bone at the implant site, you might be a candidate for bone grafting. Bone grafting may sound like major oral surgery but it is really a routine procedure performed in a dental office. If you have experienced bone recession due to gum disease, an abscess, an extracted tooth, or any other reason, let’s discuss your options. You may benefit from a dental implant from Summer Dental in Las Vegas. Other services include general and cosmetic dentistry. Schedule an appointment with us today. Dental implants are one of the greatest advances in the field of dentistry. They are an artificial tooth root that is surgically implanted into the jaw of a patient, to replace a missing root. The implant, in turn, can support an artificial tooth. Dental implants are available from Summer Dental in Las Vegas. Dental implants from Summer Dental in Las Vegas are the closest thing to getting back a natural tooth. Find out more by scheduling a consultation. In the meantime, call to schedule your next checkup and cleaning today. Our teeth have many important functions. Aside from the obvious ones, have you ever considered their role in holding up your face? When we lose teeth, the bone around the site of the extraction begins to shrink. This can be an issue when the team at Summer Dental in Las Vegas is weighing a patient’s viability for a dental implant. In the jaw bone, the movement of the teeth stimulate this process of rebuilding. When the tooth is gone, the bone starts to shrink as blood flow is reduced. Consequently, people with missing teeth not only have a gap in their smile, they begin to look older because of the bone recession and eventual facial sagging. Modern dentistry to the rescue! Because dental implants are surgically attached to the patient’s jaw, they maintain healthy bone metabolism while providing near-normal tooth function. For patients missing many (or all) of their teeth, dental implants can be used to provide an anchor for a partial denture. What if your bone has shrunken so much that there is not enough to support an implant? You may be a candidate for bone augmentation or bone grafting. This procedure is routinely completed with success. If you are missing teeth, don’t resign yourself to dentures. 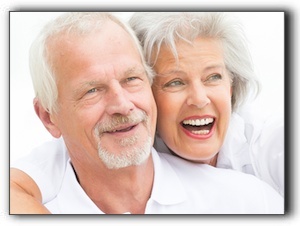 Dental implants from Summer Dental in Las Vegas provide a stunning smile! We also provide general and cosmetic dentistry. Ask us about our extended and weekend hours. Schedule an appointment today. If you’ve had years of dental problems or are embarrassed by your teeth, Summer Dental in Las Vegas can help you find the restoration procedure right for you. 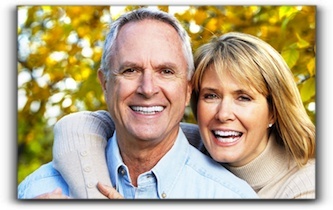 You could be a candidate for dentures or dental implants. Dentures are removable replacements for missing teeth. There are two basic types, full and partial. With full dentures, an acrylic base fits over your gums. They’re custom-made in our dental lab, from impressions taken of your mouth. If you still have some healthy, natural teeth, you can benefit from partial dentures. Partial dentures rest on a metal framework that is attached to natural teeth. Another alternative is dental implants. A dental implant is a permanent tooth restoration that is anchored into the jawbone, actually replacing both the root and crown of the tooth. Dental implants have many advantages, such as preventing jaw bone recession. Bone recession happens when natural teeth are removed. However, not everyone is a good candidate for implants. Schedule a consultation with Summer Dental in Las Vegas to learn more about dentures and dental implants. We also provide general and cosmetic dentistry. Declining health, limited mobility, financial strains – clearly, aging is not for the faint of heart. Though some challenges seniors face can’t be avoided, others can. Dental issues, for instance. Many dental problems become common as we age. Most can be remedied, such as missing teeth, gum recession, tooth damage, and yellowed enamel. With modern cosmetic dentistry at Summer Dental, mature men and women can have a fantastic smile. Regardless of your age, it is not too late to improve your smile – even if you have some missing teeth. At Summer Dental in Las Vegas, we pamper our patients. We offer comprehensive general and cosmetic dental services. We also love it when the youngsters come in for pediatric dentistry. Schedule an appointment with us today. When was the last time you looked into the mirror? Were you satisfied with what you saw? If the answer is, “Not really,” then you may want to check out these 5 great reasons to talk to us at Summer Dental in Las Vegas about cosmetic dentistry. 1. 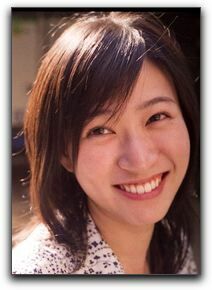 The first reason is that a little cosmetic dentistry goes a long way. Some of the most popular cosmetic dentistry procedures, such as porcelain veneers, are simple and easy to do, but they can have compelling results. 2. Next, you might be surprised at how competitively priced it is! Next time you are in the office of your dentist, ask for a price chart. You may be pleasantly surprised. 3. Don’t worry about pain, we’ll keep you comfortable. Many cosmetic dental patients expect the procedures to be painful, but we’re trained to help you stay relaxed and free from discomfort. 4. You’re never too old! Many men and women think that cosmetic dentistry procedures are only for the young, but teeth continue to change throughout your life and these procedures may be exactly what is needed. 5. We can treat your particular cosmetic dental issue. Some folks have been led to believe that they have to live with chipped, cracked, or missing teeth, but we have the tools and procedures to fix a wide array of dental troubles. If you are looking for a dentist, Summer Dental would love to help you. We provide general and cosmetic dentistry, pediatric dentistry, and clear braces from Invisalign, among many other services. Make an appointment with us today.